"The Christmas Invasion" is a 60-minute special episode of the British science fiction television series Doctor Who, which was first broadcast on BBC One on 25 December 2005. This episode features the first full-episode appearance of David Tennant as the Tenth Doctor and is also the first specially produced Doctor Who Christmas special in the programme's history. 167 – "The Christmas Invasion"
The Sycorax look on at the humans. In the episode, principally set in London, the alien race the Sycorax invade Earth, demanding that either humanity surrenders or one third of them will die. The Pilot fish Santa, as shown at the Doctor Who Experience. The newly regenerated Tenth Doctor, suffering side effects from his regeneration, crash lands the TARDIS in London. He exits to meet Jackie and Mickey, and collapses in front of them. They take him to Jackie's flat where they put him to bed. The Doctor tells them that his regeneration has gone wrong and theorises that the energy of his regeneration is luring an unseen foe to him. He passes out again and is returned to bed. The Mars space probe Guinevere One is intercepted by a giant spaceship heading for Earth. When the probe's broadcast is shown on Earth, the face of a Sycorax appears. He demands Earth's surrender and uses blood control to cause a third of the world's population to go into a hypnotic state. The Sycorax threatens to make these people commit suicide unless half of the world's population is given to the Sycorax as slaves. Harriet Jones, the Prime Minister, attempts further negotiations with the Sycorax, and finds herself teleported aboard the ship. Rose, Mickey and Jackie evacuate the Doctor to the TARDIS as the Sycorax ship approaches London. Before Jackie can return with additional supplies, the TARDIS is detected by the Sycorax and is teleported aboard their ship. Rose buys enough time for the Doctor to finally recover. The Doctor shuts down the Sycorax blood control and then challenges the Sycorax leader to a sword fight for the Earth. The leader severs the Doctor's hand. Since the Doctor is still within the first 15 hours of regeneration he re-grows his hand, and then forces the Sycorax leader to submit. The leader attempts to attack the Doctor from behind. The Doctor hits a sensor with a satsuma he found, triggering part of the wing to fold and dropping the leader to his death. The Sycorax, as shown at the Doctor Who Experience. The Doctor orders the Sycorax to leave Earth and never return before taking Rose, Mickey, and Harriet back to Earth. As the Sycorax ship moves away, Harriet orders Torchwood to destroy the ship. The Doctor becomes furious with Harriet, who tries to justify her actions by reminding the Doctor that he is not always there to save them. The Doctor threatens to bring down her government with six words. He whispers to Harriet's aide: "Don't you think she looks tired?" The Doctor joins Rose, Jackie, and Mickey for Christmas dinner. They watch Harriet on television fending off rumours about her health. This special was the first full episode starring David Tennant as the Tenth Doctor; he was only shown briefly at the end of "The Parting of the Ways" for the regeneration sequence. A 7-minute "mini-episode", set between "The Parting of the Ways" and "The Christmas Invasion", was shown as part of the Children in Need charity telethon on 18 November 2005. The Christmas special is a tradition in British television series. While this is the first story for Doctor Who clearly labelled as a Christmas special, the seventh episode of The Daleks' Master Plan, titled "The Feast of Steven", was written as a Christmas episode, even featuring a fourth wall-breaking Christmas wish to the viewers by William Hartnell. Christmas specials became an annual staple for Doctor Who, until 2018, where it was replaced by a New Years special. Although not shown at Christmas, "The Unquiet Dead" was set on Christmas Eve, 1869. The Tenth Doctor speaks with an Estuary English accent, in contrast to the Ninth Doctor's Northern one. In a 23 December interview on BBC Radio 1, Tennant explained that a line had been scripted for the Christmas special explaining that the newly regenerated Doctor had imprinted on Rose's accent, "like a chick hatching from an egg," but the line was cut from the final programme. He also briefly affects an American Appalachian accent (when he regrows his hand and continues his fight with the Sycorax leader, he claims his hand is a "fightin' hand" in that accent). The episode's opening shot is a repeat of the opening shot of "Rose", using a new arrangement of the same music. The cone-shaped building which has all its glass blown out from the ship's shockwave is 30 St Mary Axe, also known as the Swiss Re Building or "The Gherkin". The climactic scenes of the episode were shot on location at Wallis House, Brentford, one of the Golden Mile's few remaining Art Deco buildings. Parts of the episode were filmed at the Clearwell Caves in Gloucestershire. The prototype of the Sycorax swords was auctioned on eBay to raise funds for the Great Ormond Street Hospital Children's Charity. It raised £920.51. 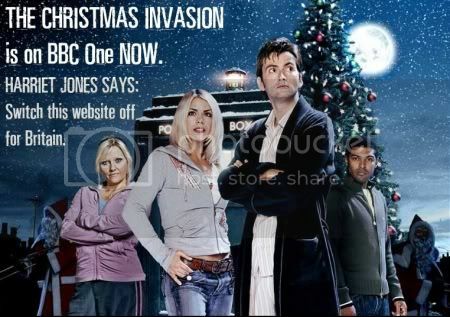 During the live broadcast, the front page of the official BBC website stated: "THE CHRISTMAS INVASION is on BBC One NOW. HARRIET JONES SAYS: Switch this website off for Britain." The tie-in website "Who is Doctor Who?" was also updated with a message from Mickey referencing the Guinevere One website, and an appeal to the Doctor to bring back Rose. The song playing during the wardrobe sequence, "Song for Ten" (named in reference to the Tenth Doctor), was composed by Murray Gold for the episode and sung by Tim Phillips. The closing credits had a new theme arrangement restoring the traditional "middle eight" section of the theme which had been omitted in the 2005 series. This was performed by the BBC National Orchestra of Wales, conducted by Gold. This arrangement was subsequently used for the closing titles of the 2006 series. Various pieces of music featured in this episode were released in December 2006 as part of the Doctor Who Soundtrack (produced by Silva Screen). These included the "Song for Ten", the music played behind Harriet Jones' speech and the music played as the spaceship arrives over London. Lachele Carl reappears as the reporter seen in "Aliens of London" / "World War Three". She is later seen in "The Sound of Drums", "The Poison Sky", "Turn Left", "The Stolen Earth" and The Sarah Jane Adventures story Revenge of the Slitheen. Overnight ratings for the episode gave a peak viewing audience of 9.8 million viewers, and an average of 9.4 — the second highest rated programme of the evening, behind EastEnders. This episode was the highest-rated episode of the Tenth Doctor era, with final ratings at 9.84 million, up until the "Voyage of the Damned", which achieved an audience of 13.8 million viewers. It is considered one of the best Christmas specials of the show. In 2014, over 7000 readers of Radio Times voted "The Christmas Invasion" as the greatest Doctor Who Christmas special with over a quarter of the votes going to it, 24.92%, a whole 10% more votes than the second favourite. Immediately after "The Christmas Invasion", digital viewers were able to press their red button to view a special interactive episode, "Attack of the Graske" written by Gareth Roberts and starring Tennant as the Doctor. The Canadian presentation on the CBC on 26 December 2005 was hosted by Piper, who was attired for the occasion in a red Roots "Canada" sweatshirt. The episode was scheduled in a 90-minute-long slot; as the episode and the presentations took less than the allotted time, the rest of the broadcast was filled with the start of two episodes of the animated programme Creature Comforts, which was set for the following 30-minute slot. The special premiered on BBC America in 2007. Unlike the Sci-Fi version, the episode was edited down to fit inside a one-hour timeslot with commercial breaks. This episode was released together with "New Earth" as a basic DVD with no special features on 1 May 2006, and as part of a second series boxset on 20 November 2006. This release included an in-vision commentary with Russell T Davies, Julie Gardner (Head of Drama for BBC Wales) and Phil Collinson, recorded before the story aired. This commentary was also made available as an MP3 on the BBC Doctor Who website. On 3 December 2005, the annual Christmas edition of the BBC's listings magazine Radio Times was released, featuring a Doctor Who cover to tie-in with "The Christmas Invasion". This was the first time Doctor Who had featured on the Christmas edition cover in the show's forty-two-year history, and the first Christmas cover for an individual BBC television drama since EastEnders in 1986. The Christmas Radio Times cover usually features artwork of a generic Christmas scene. As confirmed by Russell T Davies in the episode commentary, the Doctor Who section of that issue of the Radio Times contains a hidden message explaining what saves the Doctor: many of the paragraphs in the articles have an oversized first letter, which taken consecutively spell out "A cup of tea" (in the manner of an acrostic). A novelisation of this story written by Jenny T. Colgan including the storyline from the 2005 Children in Need special was released in paperback and digital formats 5 April 2018 as part of the Target Collection. ^ Terry Nation (writer), Douglas Camfield (director), John Wiles (producer) (25 December 1965). "The Feast of Steven". The Daleks' Master Plan. Doctor Who. BBC. BBC1. ^ Mark Gatiss (writer), Euros Lyn (director), Phil Collinson (producer) (9 April 2005). "The Unquiet Dead". Doctor Who. Series 1. Episode 3. BBC. BBC One. ^ "Merry Christmas wallpapers & Pictures". Retrieved 9 Nov 2016. ^ "Hear the Christmas Song". BBC. 10 January 2006. Archived from the original on 14 January 2006. Retrieved 20 December 2011. ^ "The New Theme". BBC. 3 January 2006. Archived from the original on 17 January 2006. Retrieved 20 December 2011. ^ Russell T Davies (writer), Colin Teague (director), Phil Collinson (producer) (23 June 2007). "The Sound of Drums". Doctor Who. Series 3. Episode 12. BBC. BBC One. ^ Helen Raynor (writer), Douglas Mackinnon (director), Susie Liggat (producer) (3 May 2008). "The Poison Sky". Doctor Who. Series 4. Episode 5. BBC. BBC One. ^ Russell T Davies (writer), Graeme Harper (director), Susie Liggat (producer) (21 June 2008). "Turn Left". Doctor Who. Series 4. Episode 11. BBC. BBC One. ^ Russell T Davies (writer), Graeme Harper (director), Phil Collinson (producer) (28 June 2008). "The Stolen Earth". Doctor Who. Series 4. Episode 12. BBC. BBC One. ^ Gareth Roberts (writer), Alice Troughton (director), Matthew Bouch (producer) (24 September 2007). Revenge of the Slitheen. The Sarah Jane Adventures. BBC. BBC One, CBBC. ^ "BBC wins Christmas TV ratings war". BBC News. 26 December 2005. Retrieved 25 May 2010. ^ "Doctor Who News: Doctor Who – The Ten Christmas Specials". Doctor Who News. 1 October 2015. Retrieved 8 October 2015. ^ "Who's on Radio Times?". BBC. 28 November 2005. Archived from the original on 26 June 2006. Retrieved 20 December 2011.